Basically, African cichlid aquarium is best decorated by making a simulation of its natural habitat in the wild as possible. This is so to make cichlids comfortable and secure. Therefore, when setting up the tank the question should be what makes an African cichlid feel comfortable and secure when it comes to their environment? They like to live in a habitat that has lots of hiding place as a refuge area for smaller fishes as well as for territorial purposes for the bigger species. The first rational thing to do is to read books, searched online for information about its natural habitat and then when sufficient info's has been gathered start planning out the materials to be used. Basically, Lake Malawi is sandy in some areas thus a crushed coral or sand substrate is adequate. Crushed coral help raise the pH in the aquarium water. If sand is preferred, I suggest the use of Tropical Play Sand. Whichever substrate is chosen, make sure that they are properly washed before placing in the tank. Now, what rocks are appropriate for your African cichlid aquarium ? Tufa rock may be used it is also known as a saltwater base rock but if honeycomb rock is available this is a much better choice. Honeycombed rocks consist lots of holes and tunnels which smaller fish can use for hiding. Once the rocks are bought, make sure to anchor it safely and sturdy in its place that will not be easily moved by the agility and aggressiveness of African cichlids. The last step in aquascaping your tank is to purchased plastic or real plants. Your choice will greatly depend on the keeper. If time is not possible it is best to pick plastic plants since live plants require constant care not only that cichlids like to nibble on live plants. However, if live plants are dearly preferred an Amazon sword is a good idea and matched it with maybe a couple of fake plants. That should do the trick. Plants can add color and beauty to the aquarium as well as a hideaway for cichlids. Place the plants in bunches or clumps it would look more natural and useful too. If fake plants are used buy only the natural colors like green. Avoid using colorful ones like blue or yellow, although they come in nice colors they do not mimic the natural habitat of an African cichlid. 1. Driftwood - this would look natural and lowers pH. 2. Shale, flag stone, slate - these are good for forest and rift lake cichlids. Very good as caves and over hangs but are not natural for Lake Malawi cichlids. 3. Small shells - good for shelter and spawning and may increase pH level. 4. Clay pots - Not natural for Lake Malawi but are great for spawning and shelter. There are many decorations that may be used for African cichlid aquarium just bear in mind to create the environment with natural effects as to where your particular cichlid originates. Lacey Bryant is a cichlid enthusiast and author, who has been caring for cichlids for over 20 years. It is her goal to see that all Cichlids are properly cared for. Here are three big mistakes that most novice aquarium hobbyist made. You should avoid such errors because it could potentially disrupt and harm your fish and plants. Do not overpopulate the aquarium with too many fish and plants, as it will cause water quality to degrade very quickly. More fish does not mean the tank will look more attractive. Have you ever wonder if it looks good on a bus or a train that is severely overcrowded with passengers? When you set up a new aquarium, introduce only a few fish between several weeks or even between months if possible. Select the smallest fish possible and build a community around a small school of fish and perhaps one or two showcase fish of your choice and modest group of bottom cleaners such as algae eating fish. Some species thrive in large numbers and prefer to live in a colony. On the other end of the spectrum, there are species that are extremely territorial in nature and will not tolerate the company of others, not even within its own kind. You should not mix goldfish with angelfish because the latter is known to be aggressive and will attack goldfish relentlessly. Likewise, angelfish are threats to the guppies so do not mix them in the same tank. Fish incompatibility resulting in fights and fatalities are further compounded by small aquarium footprint whereby the limited area of movement, dwelling, and congestion often leads to frenzy attacks among fish, even within its own species. When in doubt, check with the aquarium fish seller or do some research on fish compatibility before you decide to buy and put them into your aquarium. The Smaller tank is more critical in regard to the type of species that are able to coexist without conflicts. You can arrange rocks and plants to serve as hideouts for species that are more passive in nature. Avoid artificial plants and structures. Some people think it is a hassle to clean up debris left over by residues of dead aquatic plants thus they opt for artificial ones instead. You need to be mindful that some of these cheap artificial decorations are toxic to fish. Furthermore, isn't it better to populate your tank with natural live habitats? Let nature works its way to create the required balance ecological system. Consider live plants and ecologically friendly gravel for your aquarium. After all, live plants produce oxygen supply to the fish. In between, it is important to take note that the smaller the aquarium the more pertinent it is to do daily testing of the water quality. Observe fish behavior such as gasping, hiding, drifting, or darting, it might be an indication of imminent health dangers lurking somewhere. I grew up in Ireland on the outskirts of Dublin, and at an early age, my father purchased a farm, which became the responsibility of my Mother. Because it was at the time of war, it was obligatory for all landowners to farm their acreage, as the food was in short supply. Previously we had lived in a modest house, and now suddenly I was immersed in the life of the farm, as well as schooling. We had cattle, poultry, horses, plus a small menagerie of animals, which I had collected with great avidity. This added to a collection of dogs and cats. The figures ran to fourteen dogs, and five cats. The dogs invariably got into the hen houses from time to time, with predictable catastrophic results, all the small animals over a period of time would expire, for a host of diverse reasons. This, needless to say, would make me feel very guilty, as I had not yet come to a full understanding of life, I did not yet realize that all small animals would leave this world to go to whatever awaits us all sooner or later. I have to admit, however that carelessness and other interests, sometimes justified the comments. We had a slew of farm hands and servants on the farm, which made the TV series Upstairs Downstairs seem very clear when viewed many years later. Many amusing incidents happened with predictable regularity, horses, broke out of their loose boxes, hens got slaughtered by the dogs, the farmhands and servants created many involved "situations" all of which caused my parent's endless problems. These would make the subject of at least one book, which perhaps someday I will write, but for now, I will stick to this theme. One day I was sent into the city, to buy some electrical accessory. It irritates me that I cannot remember what it was, but I entered a large electrical store which was closing down, as the owner had passed away. Whatever I was seeking evidently was in the basement of the store, and I was directed down the stairs. I presume I found what I wanted, but in doing so, I noticed about fifteen aquariums, almost all of them empty. I had never seen an aquarium before, and in one of the aquariums in the store, there was a lone black molly. A girl assistant told me that the late owner a Mr. Handcock (that I can remember ) was a very keen aquarist, and had this department as a hobby. Because the store was closing down, they had already sold most of the stock and equipment. I got to know over time. I was soon breeding Siamese fighters, as well as mollies and several others. However, the hobby was consuming not only my time and interest but taking up all and more, of my quite strict allowance. I soon found out that there was an aquarium society in Dublin which I joined with great enthusiasm, and then learned that there was no dealer with the closing of the Handcock store. Well, this opened a great opportunity, as by enlarging my collection and buying fish and equipment from England, I could pay for my hobby, and have even more tanks etc. I called this sideline business Irish Aquatics and saved over the next 5 years from my "trading" enough to pay for, half of my first home. At this time I was in Veterinary College, and although studies, sports, the ladies, and a host of other activities, occupied my time, somehow I managed to continue my hobby, and attend the monthly meetings of the aquarium club. The club used to have a couple of shows a year, the members, as well as other societies, principally from the North of Ireland, would participate. There were categories of competition for best egg layer, best livebearer, best fish in show etc. The most attractive category by far for my taste was the competition for the most beautiful tank. Although the varieties of plants were limited at that time, the show tanks were amazing, especially as many members had access to a beautiful red sandstone which they used in many tanks as ornaments to set off the green plants. During 1997, I decided to get back into my first love within the hobby. I started to grow some plants, and experiment with making attractive layouts. I found that to achieve really good results consistently, one needed to pay close attention to many factors and that this required specialized equipment, which was not readily available, or at least not at a reasonable cost on the American market. Why not try Live aquarium plants in your fish tank, they continue to grow and give oxygen to your fish. They look great and are possibly cheaper in my experience. Your fish will be healthier and it will be visually more aesthetic. Aquascaping allows you to create a visually impressive aquarium and there a range of different aquascaping styles to choose from for you to create this effect. The style you choose should be based on your personal preference and how confident you are keeping plants generally. A Dutch style aquascape is a lush arrangement of plants, often containing a diverse arrangement of leaf colors, sizes, and textures. This can be compared to how terrestrial plants are shown in a flower garden and is immediately striking to the beholder. 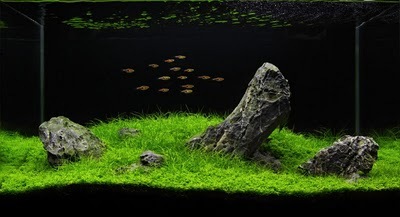 This style attempts to emphasize plants situated at different heights and on different terraces in the tank. When a strong contrast is used, such as prominent red leaves with green, this can be exceptionally striking. Particularly, this style of aquascape may be useful to consider if you are keeping an aquarium where 80% or more of the bottom of the tank will be covered with plants. Aquascaping like this was developed in the Netherlands in the 1930s, where it became popular elsewhere in the world rapidly, particularly with the growth of commercially available freshwater equipment. Straight rows of plants are commonly called "Dutch streets" and there is a wide range of plant types which can be used in them and the planted aquarium generally. The most commonly used plants are groupings which can be neatly trimmed, plants that have contrasting leaf colorations and also plants which have a feathery foliage. Members of the Hygrophila family are common in Dutch aquariums. The most important aspects of keeping plants successfully when you are keeping different species is to understand their individual needs and ensure they are similar. If you are keeping two different species of plants which need extremely different water conditions, one or both of them will grow sick and in the worst case scenario, will die. Try to ensure that the plants you wish to keep grow successfully with a similar composition of nutrients, lighting, water hardness, heating, and PH. It may take time to do the research on the individual species, especially in this style of aquascape where many kinds are used, but it is worth it for the long term. t may be advisable to have a good amount of experience keeping quite a few different kinds of species before trying to create a Dutch aquascape. You may end up wanting to use a wide variety of plants to create the desired effects. With live aquarium plants, you can overcome all the problems of a non-planted aquarium. You can improve the quality of your aeration, filtration, food and algae control. You can improve the lives of your fish. Find out how live aquarium plants can help you, help them.